Home > Golf Components > What is it about Cast Titanium Drivers? What are the benefits of a Cast Titanium Driver over a Forged Titanium Driver? A forged titanium is usually a 4-piece construction, i.e. 4 pieces of stamped and shaped titanium plates are welded together. The welding is tig welding which is increasing weight at the welding line. When the plates are manually welded together, the loft, lie and face angles are subjected to a tolerance; heads may also have a weight tolerance. Forged heads have the advantage that a certain angle can be handpicked to meet a certain customer request. 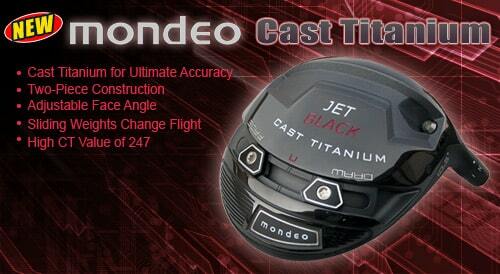 Cast titanium driver heads are usually 2 piece construction. The casting allows for more complicate and innovative design of head profiles. The biggest advantage however is the uniformity of production, all heads are made from the same mold, less manual welding is needed. Tolerances are tighter and accuracy is considerably improved. All heads are performing same as per design purpose. Cast Titanium driver heads require a separate mold for each loft and require a much higher investment than forged titanium drivers. Cast titanium drivers are more expensive than forged driver heads. The new Mondeo Jet Black Cast Titanium driver gives you all benefits in one head: adjustable hosel sleeve + sliding weights + accuracy and uniformity of a genuine cast titanium driver at an affordable price. Head comes with a complimentary wrench, 1 x pre-installed shaft adapter and a special ferrule.